August 05, 2010 - Many students from all walks of the globe, dream of becoming a pilot since the invention of the airplane and this is the same for young people living in China. However, there is a big difference in the opportunity for students to receive flight training. In the United States a student can go to his or her local airport and enroll in flight training and become a pilot at a fairly reasonable price. In China it is not the same and as a result many students travel aboard to receive flight training but at a risk. Michael Luo and Bravo Chen, both age 23, left China and went to Ontario, Canada to pursue their dreams of one day becoming an airline pilot. 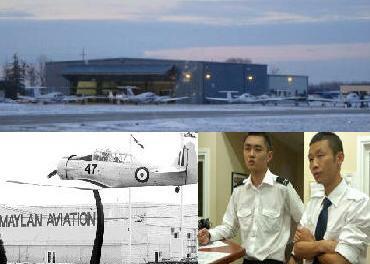 Both young men enrolled into flight training at Maylan Flight Academy located at London International Airport, London, Ontario. Each of the young men paid close to $55,000 for tuition. This cost was to provide them with the training needed to receive a commercial pilot?s license and instrument and multi engine ratings. In addition the tuition was to cover the students' living accommodations. However, on June 24th Maylan Flight Academy doors were closed by their landlord, Tom Lawson, for failing to pay 13 months of back rent, totaling $136,500. As a result over 60 students found themselves on the street with an uncertain future. Lawson leases the property from the airport, had owned Empire Aviation but has sold 60 percent of his shares to Davi Joe, a Chinese Canadian businessman, who renamed the company Maylan Flight Academy in 2007. Davi Joe had owned a flight school, Maylan Flight Academy at Dunnville Airport (CDU9) in Dunnville, Ontario, Canada in which he started the flight school to train Chinese nationals to become commercial pilots. In April the school closed its doors and transferred over 100 students to the Maylan location in London, Ontario. At that time the Dunnville School was under investigation by the Canadian Security Intelligence Service (CSIS) which is Canada's national intelligence service and the Royal Canadian Mounted Police (RCMP). The Federal Immigration Minister Office had warned the school that there were student visa issues and if not corrected the school would be closed. In addition the students had complained to authorities that they were not getting the flight hours as agreed to and students claimed their living accommodations were substandard. In one example nine students were living in one three-bedroom townhouse. "I got a sense over the months that they really didn't know how to run this school," said Ron Speer, a board member of the Dunnville Chamber of Commerce. Both Lou and Chen face eviction for non-payment of rent at the cramped two-bedroom apartment he shares with five classmates. They both worry the money that was given to them by family members maybe lost. Chen said he?s spoken to Maylan?s owner, just once since the school closed. ?He told me Maylan would be re-started someday, but I don?t know when. But then he totally disappeared. ?